Passengers may collect the ticket at the ticket office in the train station. 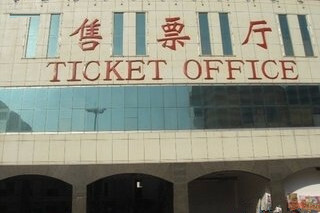 It is easy to find the ticket office in the train station, usually with eye-catching Chinese words “售票厅” or “售票处”(Chinese for ticket office) on the building. There will be several ticket windows in the office. Just line up and wait for your turn. If passengers book train tickets online, there will be an confirmation number. To collect the paper tickets, passengers should show the passport and confirmation number to the working staff in the ticket window. Then they will print out the paper ticket for passengers. Passengers could take the ticket and passport to board the train. The photocopy of the passport can also be used for collecting the ticket. 1. Make sure you arrive at the right train station. There are usually more than one train station in big cities. 2. Make sure you have your confirmation number and passport. Otherwise you cannot get your ticket. 3. If you want to print out the ticket at the train station at the departure date. It is suggested that you arrive at the train station at least 2 hours before the train departs. 4. 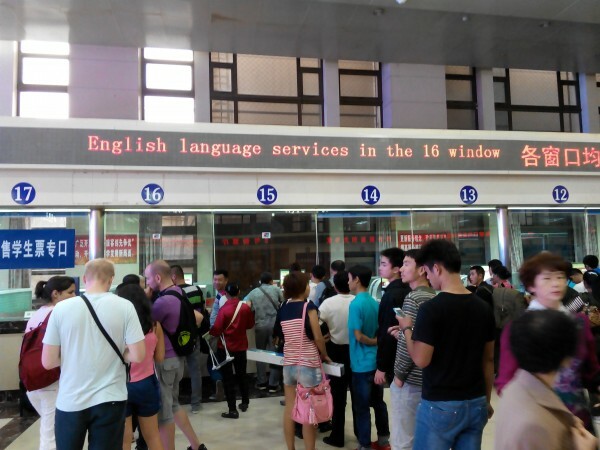 There are English window for foreigners at the train stations in big cities. For small train stations, it seems difficult to find someone speaking English. Therefore, it is best to write the confirmation number on a paper and show it to the working staff. 5. Once you have printed out the paper ticket, you cannot change or return the ticket online. You can only change or return the ticket at the train station by yourself. 6. Train tickets can only be changed or cancelled before the train departs. Even if the passenger did not take the train, he cannot have the refund without cancelling the ticket. It is different from airline tickets. Which platform no does train no G86 from Guangzhou stand on 19th April. Train number G 86 from Guangzhou departure from which platform number. Pl let me know. The platform is arranged by the local train station. There will be a screen showing the number of waiting hall and platform number at the train station. for the ticket 1st Soft Cabin (RMB 669), can the ticket purchase by one person but 3 person stay in the same cabin? Can you send the paper ticket to Overseas (Malaysia)? If yes, how much is your charges? Thank you. No, it is not allowed. It is recommended that we send you the tickets to your hotel in China. I’ve planned to buy online train ticket. Should I change the voucer to train ticket at the train station? When you book a ticket on our website, we will give you a E-ticket number. You can show the number and your passport to the staff of the ticket window at the train station, then they will give you the train ticket. I would like to change my train ticket from guangzhou to guilin 2 ways to Shenzhen, is it ok? it b closed during the night??? for example at 3:00 am? I think there are one or two windows are open for 24hours. Once you have the voucher, Can you pick up train ticket at any train station or it has to be at the departing train station? If you book a E-ticket, you can collect the train ticket at any train station in mainland China. Quiero comprar billetes de tren de alta velocidad para tres personas de shanghai a beijing i/v y nos entreguen los billetes en el hotel que tengo reservado en shanghai. Cuando tengo que meter los datos del hotel ? Sólo puedo marcar la casilla de entrega. Cuando relleno nombre, pasaporte y entrega, no me deja poner la direccion del hotel y antes de pagar , quiero que me confirmen ese dato muy importante para mí . You can try to make a booking on our website. You will need to offer us your name, passport number and hotel details during the booking. It depends on your ticket information. Can I collect all tickets ordered (i.e Shanghai- Xian, Xian – Beijing) at the same station (i.e Shanghai) at the same time?